Classroom learning can only go so far. And in order to embrace the secrets of today’s most successful brands and businesses, you need to experience them first hand. That’s why Taste of Nova Scotia (Taste) turns to Redpoint regularly to orchestrate Best Practices Educational Missions: experiential learning journeys that put participants directly into trailblazing companies for hands-on immersion with top executives in their field. Here’s how it works. Each year, we collaborate with Taste on a theme (such as experiential tourism, culinary tourism, product development, innovation, etc.) and a short list of possible geographic locations. Then, after much research, Redpoint recommends a regional destination that provides a meaningful cluster of learning opportunities around the chosen theme. Once a destination is selected, Redpoint rolls up our sleeves and gets to work. For each mission, we create a custom itinerary of educational experiences and then plan the entire journey from scratch – from transportation and logistics to workshops, educational sessions, and entertainment. Every journey is anchored by visits to leading area culinary/tourism businesses, featuring meetings and behind-the-scenes tours with owners and C-level executives. Redpoint works in advance with these innovators to ensure they’re prepared to share relevant stories of their history, challenges, successes/failures, and game-changing ideas with the Taste mission participants. Recent missions have visited Boston MA, Portland ME, Cape May NJ, Philadelphia PA, and the Finger Lakes region of New York. 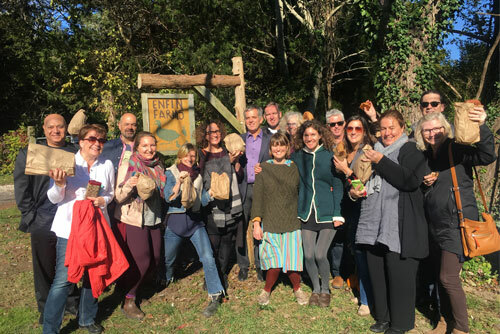 And mission participants enjoyed exclusive, one-of-a-kind learning immersion at such renowned businesses as Stonewall Kitchen, Taza Chocolate, Allagash Brewing Company, Omni Parker House, Red Jacket Orchards, Wegmans, La Colombe, Reading Terminal Market, Cape Resorts, Di Bruno Bros, and more. Each mission offers 10 to 15 immersive experiences over a five-day period, and a Redpoint host leads summary and interpretive sessions along the way to help participants translate learnings into actionable initiatives for their own businesses. It’s our job to not only secure thoughtful, substantive learning opportunities…it’s also our job to curate the journey in a way that keeps participants energized, motivated, interested, and not mentally exhausted. These folks are learning from sun up to looooong after sun down, and we make sure their attention spans get recharged often throughout the week. And we must be doing this well, because our last mission received an average satisfaction rating of 9.45 out of 10 on the post-mission surveys…and it was the most jam-packed one yet! See a highlights reel from the Finger Lakes mission here.